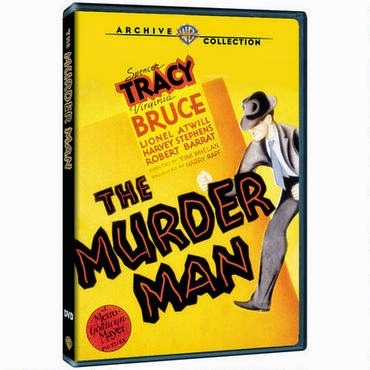 THE MURDER MAN (1935), which was just released by the Warner Archive, is an entertaining film blending newsroom drama and murder mystery. 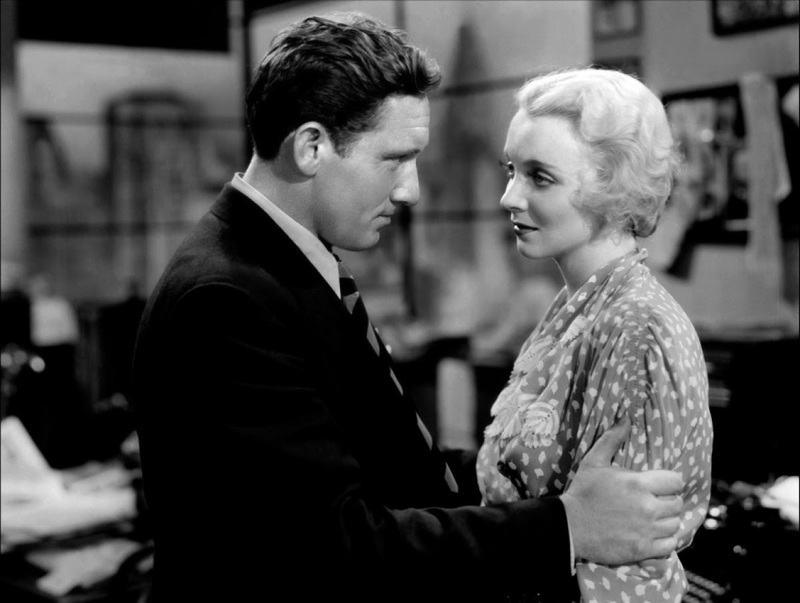 THE MURDER MAN stars Spencer Tracy and Virginia Bruce, and it's especially notable as the feature film debut of James Stewart. Tracy plays newspaper reporter Steve Grey, nicknamed "Murder Man" for his reporting on homicide cases. Steve's latest story, on a crooked financier (Harvey Stephens) who murdered his partner (Theodore Von Eltz), is particularly remarkable as he keeps scooping his rivals; somehow Steve's stories are always on the street just as new information has been uncovered. The stories are really out there too fast, but the timing doesn't register as suspicious to his admiring employer and colleagues. Eventually the reasons behind Steve's fast reporting -- not to mention his drinking and depression -- become apparent, and it's not what anyone expects. THE MURDER MAN is a fast-paced 69-minute yarn with a creative story. As a matter of fact, one aspect of the plot, involving a dictation machine, seems to foreshadow DOUBLE INDEMNITY (1944). Tracy leads an excellent cast; his character is rather insufferable for most of the film, for multiple reasons, but it's in service to the story so the viewer doesn't mind that too much. Lovelorn Bruce, playing the newspaper's advice columnist, is the recipient of audience sympathy, although it must be said it's hard to understand what she sees in the hard-drinking Steve. The most engaging aspect of the film is the newsroom setting. 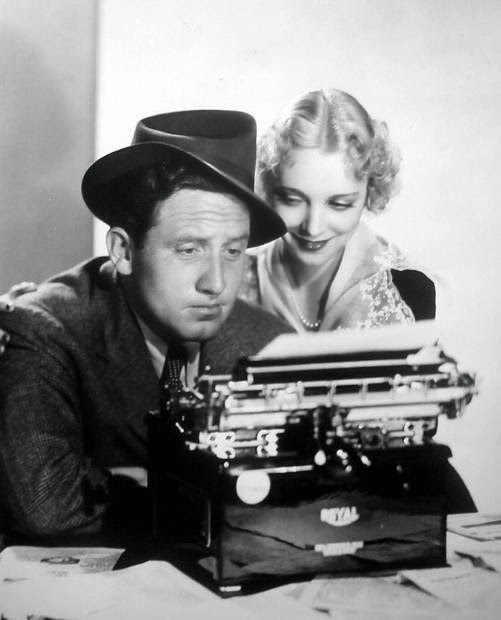 Anyone who loves a good '30s newspaper film can't help loving the gang of reporters sitting around waiting for a story to break: William Bendix, George Chandler, and "Shorty," played by lanky Jimmy Stewart. Who could resist that group? Stewart stands out amidst a collection of pros; little wonder he became a major star within a couple years' time. The deep cast includes Lionel Atwill as the police captain and Robert Barrat as the newspaper editor. Also in the cast are William Collier Sr., Bobby Watson, Lucien Littlefield, Fuzzy Knight, and high-voiced Jeanie Roberts. THE MURDER MAN was directed by Tim Whelan, who cowrote the story and screenplay. It was filmed in black and white by Lester White. The Warner Archive DVD is a very nice print. The DVD includes the trailer. My Dad's favorite line came shortly after the murder, as Lionel Atwill's police captain is asked if he knows who did it: "the man who fired the shot!"